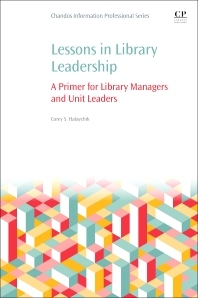 Lessons in Library Leadership: A Primer for Library Managers and Unit Leaders takes on the topic of management positions within libraries and how many of them are filled by candidates with no formalized training. This lack of preparation often leads to added stress as they scramble to learn how to lead, to formulate departmental goals, to conduct effective assessment, to think and plan strategically, to counsel employees, and much more. This book will serve equally as a primer for librarians new to management and those needing a refresher in basic management concepts. Seasoned managers may also look to this guide as a quick reference resource covering multiple management subjects. The contents of the monograph include basic concepts, real word examples/case studies, and bibliographic information for further management skill development. Librarians new to management positions and those looking for an inclusive management guide. Corey S. Halaychik is Assistant Professor and Electronic Resources Specialist for The University of Tennessee Knoxville. He has held previous positions in reference and access services units in both public and academic libraries; including serving as Chair of the Department of Library Services at Three Rivers College in Poplar Bluff, MO. He has an MLIS from Florida State University and a MS in Leadership from Grand Canyon University.